We all wear a MASK outside, be it a workplace, in family, relationships, in general to the outside world. The most important kind of freedom is to be what you really are. You trade in your reality for a role. You trade in your sense for an act. You give up your ability to feel, and in exchange, put on a mask. There can’t be any large-scale revolution until there’s a personal revolution, on an individual level. It’s got to happen inside first. Your Joy is Your sorrow UNMASKED. It helps one to get in contact with your inner self and this knowing is helpful so that you can live with more purpose and joy. Psychodrama is essentially a group action method that helps a person to embrace one’s own capabilities. This could be used in clinical setting (hospitals, therapy centers), non-clinical setting like a business establishment in team building, conflict management, stress management, identifying and working with stress, improving communication, building trust, identifying issues etc. This is a spontaneous and creative method which is used by certified psychodramatists who is otherwise called the Psychodrama director. A director enables or facilitates a re-enactment of real life situations, past incidents / situations or an inner mental process but, acting them out in the present time. Rs. 5000 + Rs. 900 (GST) for others. Working Professionals, Home makers, Psychotherapist/ Counsellor, Students of Psychology and Social Work and anyone who is curious to experience Psychodrama. This training will give you additional tools to understand and build your profession. He has 34 years of experience in the field. Herb maintains a part time practice for personal growth, training and supervision. He is a Fellow and life time member of the American Society of Psychodrama and Group Psychotherapy. Herb is an affiliate member of the Bangladesh Clinical psychology Society. 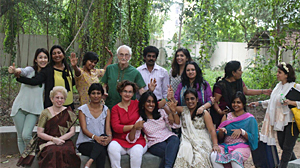 Herb serves as faculty member of Indian Institute of Psychodrama, He is Professor Emeritus of Theater at Johnson VT State College, a 2009 Fulbright Scholar to Bangladesh and since 2013, a member of the Fulbright Specialist Roster. He is a practioner of Tibetan Buddhism; a student of Lama Norlha Rinpoche, Abbot of Kagyu Thubten Choling Monastery and Retreat Center in Wappinger’s Falls, NY. He is authorized by Lama Norlha to teach basic meditation practices. Ms Magdalene Jeyarathnam, has worked for over 20 years as a Psychological Counsellor. She is an Expressive Arts Therapist, and a board certified Psychodramatist. She has worked as a consultant to several governments, the World Health Organisation (WHO), and the United Nations International Children’s Emergency Fund (UNICEF). She is a member of the International Association of Group Psychotherapy and Group process.